So here we are in week 2 on the ORC. 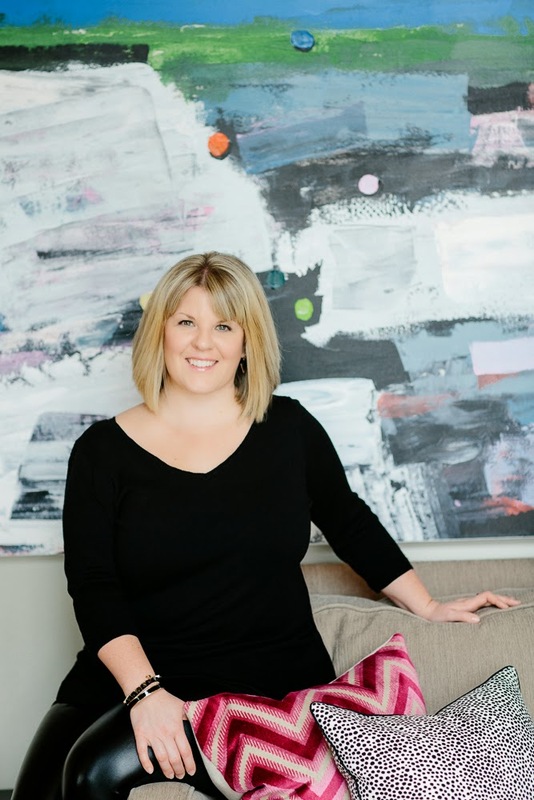 If you unfamiliar with this whole One Room Challenge thing, Linda from Calling it Home created this twice a year challenge for design bloggers to complete a room in just 6 weeks all the while documenting & sharing the process. This in my first One Room Challenge & I've taken on my kids Jack n" Jill. If you want to get caught up to speed & what we started with you can see it here. This week the tiling began & finished. I am so in love with this Hex tile. I wanna marry it. My whole idea with this space is to play with shapes. Octagon, circle, rectangles, triangles & squares will all be playing a part in this space. Tiling can be completely bonkers in terms of cost, not just in the materials, the labour alone can kill ya! But, I have a little secret. I only pick 1 "showstopper" in this case it's the floor. To even things out, I hit up my local tile clearance outlet & got the white glossy penny rounds for the shower floor & a large scale 8" x 24" white wall tile for the shower walls. It's all in the presentation, so to make this plain tile not look like a blue light special, I had the walls laid in a brick pattern & grouted the shower floor & walls in charcoal grey to give contrast & definition. To finish things off the shower walls & niche were trimmed out in a black metal edging. I picked up the Ikea floating vanity. 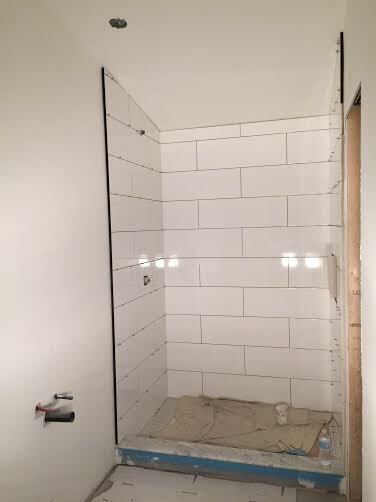 The shower glass panel was measured & has been ordered. One thing I need you to weigh in on is "to splash or not to splash" on the vanity countertop. Lets face it, this bathroom is for my kids, they are almost 7 & they seem to get water everywhere. It only makes sense to me, to have a backsplash of some sort. I have 2 thoughts & I want need you to weigh in because I'm completely torn. My first thought is to do a 4"-6" splashing the same material as the counter top & a large round decorative mirror? Similar to this from Anatomy Design. 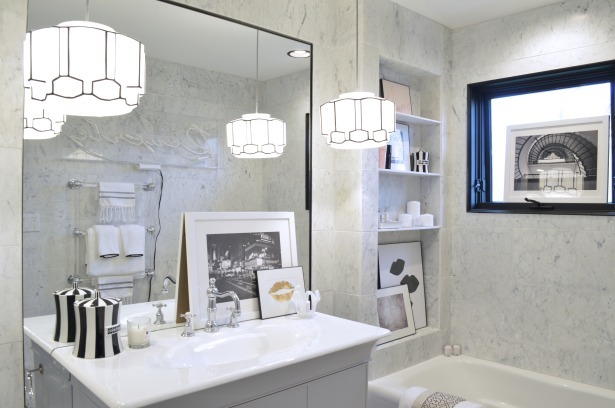 Do you prefer a large mirror that is the same width of the vanity & sits at the counter. I thought it could be trimmed out in the same black metal edging as used around the wall tile, kind of like Christine's. I figure this option will do double duty, be a mirror & a backsplash. I've begun purchasing accessories & sorting out the art & lighting situations & will fill you in on those goodies next Wednesday. Be sure to check out the 20 main ORC participants from Wednesday & also the guest participants here. 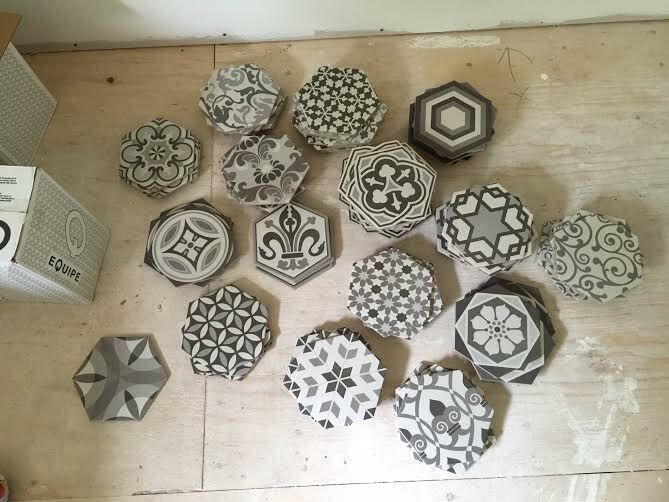 Those tiles are looking gorgeous, can't wait to see how it all comes together! 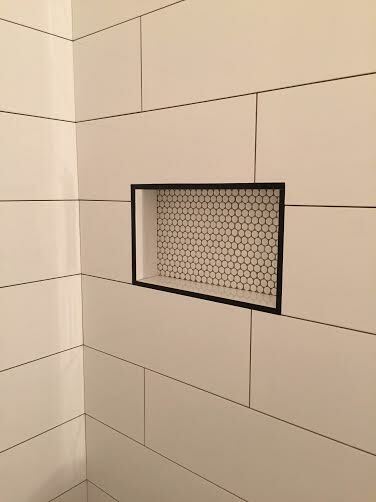 I love love how the black edging looks in that shower niche with the penny tile inside. Your idea to mix the shapes in the kids bath is so fun!!! And thanks for the shout out on the mirror. It's definitely a tough call. 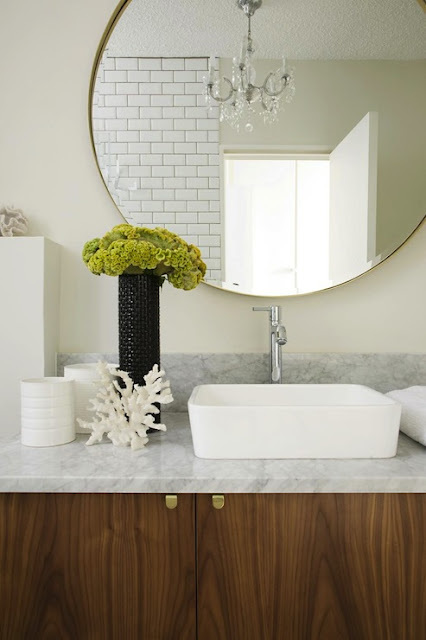 On one hand, I like the idea of bringing in your counter top and introducing a new shape again with the mirror. Are you counters marble? If so, I like that that would tie in the threshold as well. On the other hand, I like the black edging a lot and have been super happy with how mine turned out. It is a bit of a pain to clean when stuff is on the counter though- and that would be worse with kids. So I guess I'm no help lol. Either way, it's going to be fabulous! love the floor. outstanding. we are working on a jack & jill for our twins right now too (should have done this room for ORC!!) and had the same question about mirror. I prefer your first option with the back splash, but my husband pointed out that mirror height is pretty high for kids to see... good luck! happy to watch this unfold! Oh, I just love the floor!! I love your idea to play off different shapes in the room. I can't wait to check back next week. 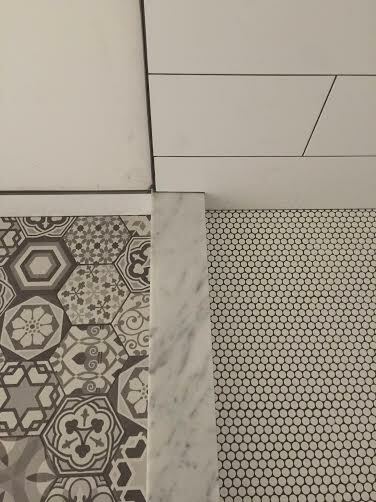 Oooh that hex tile. Swoon. It's looking so good! I like the round mirror option best. 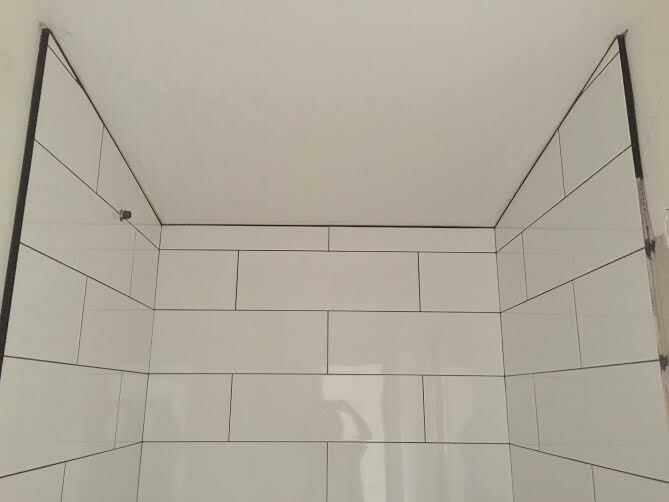 Your tile selection is great, love the dark grout & the penny tile detail in the shower. 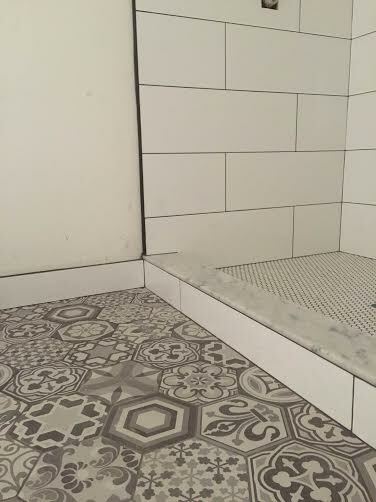 I like how you outlined the tile shower surround in black and the whole mixing and matching of tile. Great job, you completed so much! love it Hollie!! 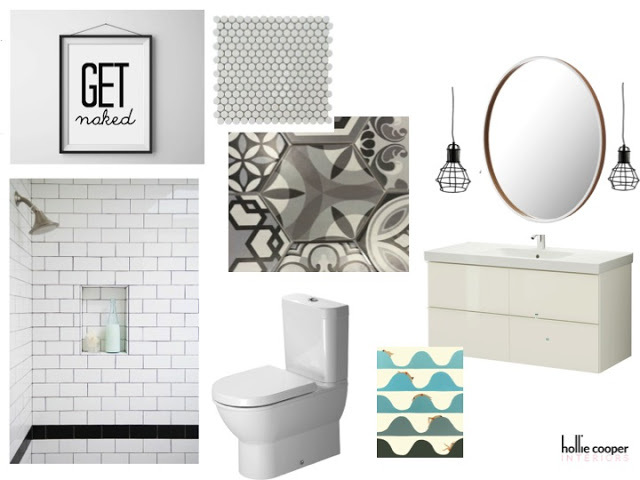 So much fun and l am loving the floor and the black trim on those white tiles in the shower! I also can't decide on round or large mirror! Can't wait to follow along next week! I have never seen anything like that hexagon tile! So pretty! 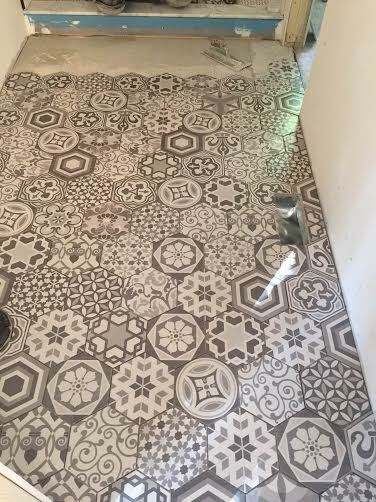 That is the most gorgeous tile - I am in love! I vote for option number 1. I totally hear you on the messy kids. I've got a 12 year old, 10 year old and a 4 year old and I feel like they just get messier the older they get. This looks good so far! Option 1 for sure. The tiles are amazing. I say do the counter backsplash and round mirror - I love round mirrors! 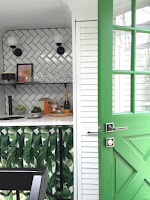 I love how all the tile works so nicely together and I'm going to have to steal your black trim idea! Really loving those floor tiles!!! How big are they? Looks like they would make cool coasters. As for your splash decision - tough call. I like Christine's black trimmed mirror that goes right down to the countertop, but also like the practicality of the backsplash with round mirror. Sorry, I know that's not much help!